Let’s face it, the Christmas season might be brimming with cheer and goodwill to all men, but it isn’t exactly brimming with creative potential. It’s a festival of kitsch and cliché; a time to find comfort in the familiar. So the Christmas stamp isn’t an obvious place to look for a bit of original visual thinking. But, the compact canvas of a postage stamp, demands a seriously hardworking picture. And it's a challenge that a handful of designers have risen to since the concept of festive philately took off in the 1950s. So, we asked Scriberia's creative director, Dan Porter, to pick his highlights of this modern festive tradition. Below are his top five stamp designers, who embraced tradition without allowing their talent to drown in tinsel. Even her name sounds Christmassy! Dolli Tingle made a good career as an illustrator of cute and colourful children’s books in the 1950s and 1960s before the US Postal Service came knocking. Her simple, block colour style lent itself well to stamps, and her Christmas design for 1973 is remembered as an all-time classic. Channelling memories of her Chicago childhood, her image of a Christmas tree covered in ornaments was created in needlepoint. The unusual, and quietly revolutionary choice of medium, won her the (no doubt coveted) Woman of the Year Award from the American Needlepoint Guild. Nothing too ground-breaking about the subject matter, but with her keen eye for colour she delivers a festive feel and keeps it classy. It's like eggnog in the form of a stamp - and that’s not a sentence I use very often. Maggs is a creative chameleon. Best known as a photographer and conceptual artist, his uniform grids of stark black and white photos, have graced many a cool contemporary art space. They give little clue to his previous incarnation as a colourful, quirky graphic designer and illustrator, whose jazz record sleeves and magazine covers embodied the Greenwich Village vibe. He was a playful, restless spirit and his native Canada loved him for it. They first asked him to design Christmas stamps in 1973 and, true to form, with flat colours and chunky black lines, he cut through the Christmas schmaltz like cranberry sauce through a turkey dinner. When they asked him again a few years later, it was a completely different Maggs on show. In documentary photographer mode, he snapped a collection of slightly depressing wooden toys from days gone by - to remind the folks of 1979 of more innocent times, or perhaps to remind them how lucky they were to get that Slinky. It feels as though Maggs was using the Christmas stamps to send a little message home from the latest stop on his creative odyssey. "Hi guys, here’s where I’m at right now. Happy Christmas!" These beautiful stamps were designed by Hil Bottema, and as far as I can tell the original designs were genuine paper cutouts created with some incredibly intricate scissor-work. 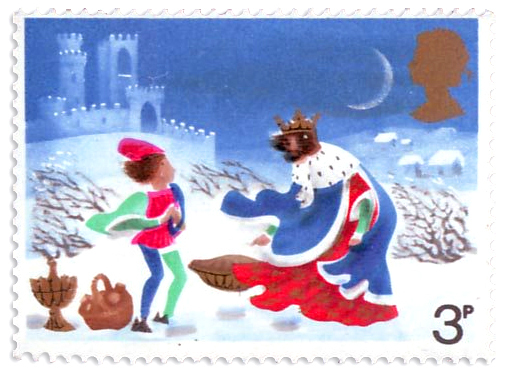 These so-called ‘children’s stamps’ raised money for Children’s welfare, and though most are Christmassy, the set covers a couple of other important festivals in the year too. The Bottemas were a family of prolific painters and illustrators and Hil focused on illustration and graphic design with paper cutting a particular specialism. She also worked as an archivist at a folklore museum and you can clearly see her interest in folk art here. Paper cut decorations are a big part of Dutch Christmas festivities, as they are all over Northern Europe, so it’s lovely that she’s applied that tradition to stamp design. The white on colour has real punch, and the level of detail is just right for the small scale of the stamp. Perforated perfection. Kanchev is probably not as well known as he should be these days, but there’s no doubt he was up there with some of the great mid-century graphic designers. If he hadn’t been Bulgarian he might have been mentioned more often in the same breath as the likes of Paul Rand and Saul Bass, but then, if he hadn’t been Bulgarian his work might have lacked a vital ingredient. Because while his designs are unmistakably modern, the influence of Bulgarian folk art is always there. I’m no great expert on Bulgarian folk art - not many people are - but I can see a clear path between the simplified forms and decorative patterns of rustic woodcuts to the pure graphical clarity of Kanchev’s work. Looking at his amazing portfolio of logo designs, it’s not hard to see that he’s often borrowing from traditional motifs and knocking the rough edges off them. That’s why the Christmas stamp was the perfect gig for Kanchev – it's the perfect marriage of festive tradition and clean, clear modern graphics. Two things of which he was a master. I’m going to finish with some British stamps. We did invent stamps after all - and, according to some, we invented Christmas too - so it’s only right. And no top five would be complete without mention of David Gentleman, the undisputed godfather of British stamp design. In the mid-Sixties, during legendary Labour MP and staunch anti-monarchist, Tony Benn's tenure as Postmaster General, he made clear his desire to remove the Queen's head (... just from our stamps, not from her body!). This was met with great resistance, not least from the Queen herself. So Benn turned to David Gentleman, a promising young designer, to come up with a solution that would satisfy both the Queen's desire to stay on the stamp, and his desire for stamps to feature 'non-traditional' designs. Gentleman proposed to use a miniature head in the corner of the stamp, freeing up lots of space (relatively speaking) for original artwork - and Her Majesty approved. Of all Gentleman’s Christmas stamps, I like his iconic '12 Days of Christmas' stamps from 1977. But I prefer this 1973 set which tells the story of Good King Wenceslas. I love the way he’s told the story across the set, like a comic strip. You don’t often see that. The composition and storytelling on each stamp is perfect and I love the use of the moon to show the passing of time. The architectural details give it a bit of bite and stop it getting too chocolate-boxy. King Wenceslas really was ‘good’ wasn’t he? What a lovely, thoughtful bloke.